2015 Ford with a Plow? The winter season of 2014 has been on for the record books. Snowstorms have blanketed the country from coast to coast and have left several areas crippled for weeks. 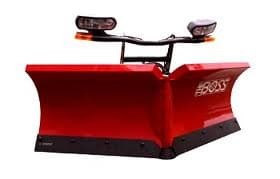 With all the attention on the weather in the country, Ford has decided to implement a new package into their 2015 Ford F-150 that will help to combat those effects of the snow. The newly redesigned F-150 is coming with a snow prep option for buyers next year. This means many of those areas that were devastated by severe snow conditions will now have an army of Fords on the front line helping to clear the way. The representatives at Ford explained that the 2015 F-150 will be the first of its kind to be manufactured with a snow plow option for buyers. They went on to explain that the need for the snow plow has put the manufactures production efforts on high alert. The snow plows package will be available on all the different type cab configurations of the F-150. This includes the SuperCrew, SuperCab, and the RegularCab. The plows will only be installed however on the F-150 models with Lariat trims and four wheel drive, XL, and XLT designs. These vehicles will need to be powered by the 5.0 V8 engine in order to be able to power the plow successfully. The maximum weight of the plow package comes it at only four hundred and fifty pounds. The designers explained further that when the truck is in snow plow mode it will receive dedicated power by temporarily shutting off power to some of the nonessential accessories. When the trucks begin rolling off the assembly line later this year, they will not come with the plow or the installation. Buyers will need to visit a qualified Ford Modifier in their town to complete the assembly. The newest F-150 will be manufactured using more high strength steel. By using this type of steel, the overall weight of the truck drops by over 700 pounds. When the truck is lighter, the vehicle handles much better than a heavier truck. This will make the process of snow plowing much more effective. The new snow plow prep kit enables buyers of Ford trucks to have even more tools at their disposal when it comes to getting the job done. The price for the new plow package was not disclosed as of yet, and should be available when they trucks reach the dealers later this year.